A 2011 study conducted on behalf of the European Commission. (3) the identification of key characteristics constituting an “independent regulatory body” in the light of the AVMS Directive. The findings of the INDIREG study are based on information that had been gathered with the help of country experts, regulators, governments and stakeholders. Documents created during the project are being published as annexes to the Final Report. The country-specific information originates from 2011; please see EMR's Report „AudioVisual Media Services- Regulatory Authorities’ InDependence And Efficiency Review“ for 2015 information, and based on the same methodology. Read the AVMS2015 RADAR Report here. Albania, Australia, Austria, Belgium, Bosnia and Herzegovina, Bulgaria, Croatia, Cyprus, Czech Republic, Denmark, Estonia, Finland, France, Germany, Greece, Hungary, Iceland, Ireland, Italy, Japan, Kosovo (under the United Nations Security Council Resolution 1244 of June 10, 1999; UNSCR 1244), Latvia, Liechtenstein, Lithuania, Luxembourg, Macedonia, Malta, Montenegro, Netherlands, Norway, Poland, Portugal, Romania, Serbia, Singapore, Slovakia, Slovenia, Spain, Sweden, Switzerland, Turkey, United Kingdom, USA. Workshop Report "How independent are you really?" The organizers of thw workshop are happy to share with you the report kindly drafted by Eugenie Coche and reviewed by the organizers. A research team, led by IViR’s Kristina Irion, had been tasked with an assessment of the independence of the Serbian media regulatory authority REM (see below). On 6/7/2018 the final study has been published. Download the study in Serbian from the REM website. Download the study in English. How independent are you really? The 2011 INDIREG methodology formulates a scientifically-backed methodology to assess the formal and actual independence of media regulators. In 2018, the EU legislator is about to pass a legislative update of the Audiovisual Media Service Directive that would mandate independent regulatory bodies in the member states, while specifying some of the requirements to guarantee this independence. This in turn will increase the need for a tool with which different aspects of independence can be assessed and monitored. This workshop is about evaluating and updating the INDIREG methodology in light of the latest developments, new competences of media regulators and insights from applying the tool. This workshop will assemble members of the initial INDIREG study team, EU policy-makers and representatives of media regulators in order to review the INDIREG methodology. This in turn will ensure the continued relevance of the INDIREG methodology to be used for the next lifecycle of assessment media regulators’ independence. The workshop receives support from the Dutch Foundation for Democracy and Media (www.stdem.org). Responding to a request by the Regulatory Authority for Electronic Media in Serbia, the Council of Europe Secretary General has requested assistance for an assessment of the independence and efficient functioning of the Serbian Regulatory Authority for Electronic Media (REM) using the INDIREG methodology, developed in 2011. The work is carried out by Kristina Irion, Sara Svensson and Michèle Ledger. The objective of the study is to apply the formal and de facto ranking tools to REM, based on the country tables and information gathered from stakeholders and other interested parties during June, July and August and to propose policy recommendations. The draft ranking tool and the country tables justifying the formal ranking tool are open to public consultation until August 20, 2017. On Monday September 26 2016 the CULT committee of the European Parliament has held a hearing on the Audiovisual Media Services review. 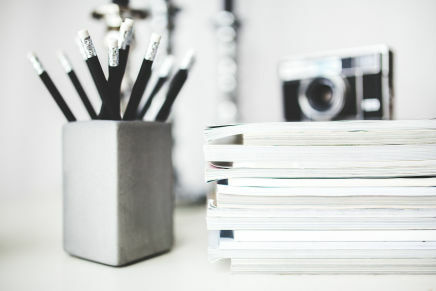 In its legislative proposal of May 2016, the European Commission proposed introducing an obligation for Member States to guarantee the independence of their media regulators (specifying a number of independence requirements). The draft report of the CULT committee that was published, however, made various modifications to this. In a blog post Peggy Valcke, research professor at the KU Leuven Centre for IT & IP Law – IMEC/iMinds, argues that the European Parliament should take responsibility for protecting European citizens’ interests in free, pluralistic media and, hence, independent regulatory oversight. 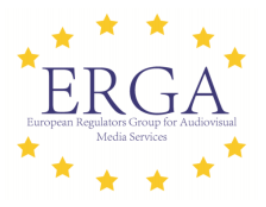 In a statement (8 April 2016) the group of European audiovisual regulators warned about currrent developments in several countries with regard to the independence of the competent regulatory bodies. Read the ERGA statement here. 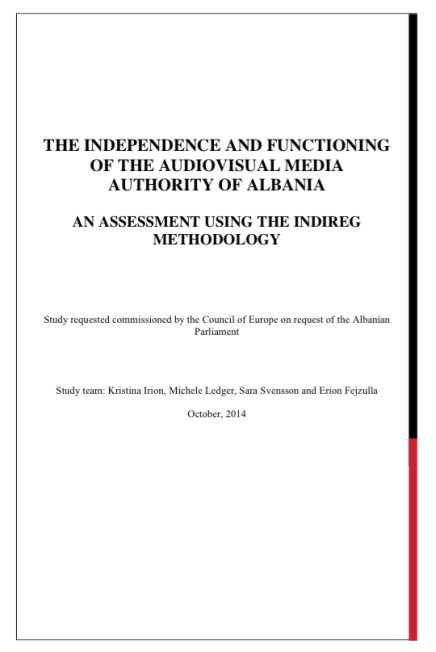 Responding to a request by the Speaker of the Assembly of Albania, the Council of Europe Secretary General has requested assistance for an assessment of the independence and efficient functioning of the Albanian Audiovisual Media Authority (AMA) using the INDIREG methodology, developed in 2010. The work was carried out by Kristina Irion, Sara Svensson and Michèle Ledger (Cullen International).http://best-custom-essay-writing.net/The final report is available here (pdf).The objective of the study is to apply the formal and de facto ranking tools to AMA, based on the country tables and information gathered from stakeholders and other interested parties during September and October and to propose policy recommendations. Media independence is vital for democracies, and so is the independence of the regulatory bodies governing it. 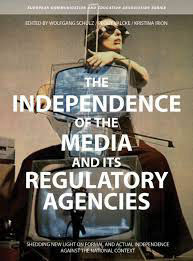 The Independence of the Media and its Regulatory Agencies explores the complex relationship between media governance and independence of media regulatory authorities within Europe, which form part of the wider framework in which media’s independence may flourish or fade. Based on research in more than forty countries, the contributions analyze the independence of regulators and draw links between social, financial, and legal frameworks. Part of the study was to rank the identified indicators. The result of this weighing is a ranking tool which is able to help interested parties to self-assess the risk potential for the influence of external players, thereby providing indications regarding potential attention points. The tool is to measure the risk of influence by external players (rather than measuring the level of independence of the respective regulator). This enables a more objective method for ranking the indicators. The approach follows the overall distinction between formal (legal set-up) and de facto (actual situation) indicators, resulting in two separated visualisations.It was decided to rank only those indicators that would give a clearer, and probably a more objective, result in terms of influence. 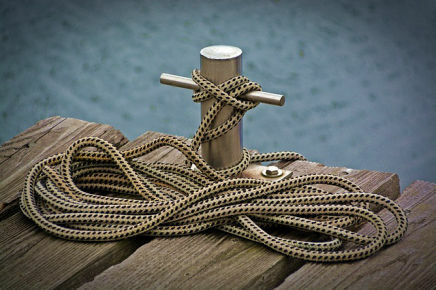 If an indicator can be interpreted as being a route for in-fluence, while at the same time being a source of autonomy, it has not been included as an indicator. 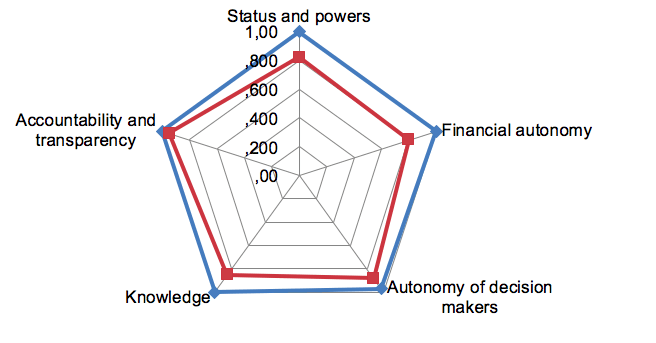 For each dimension, only indicators that are associated with the power to secure against potential influence (especially from politics and industry) were used.The surveyed indicators both in the formal and in the de facto division are grouped according to different possible ways of influence by external players. - Transparency and accountability mechanisms. Download the INDIREG RANKING TOOL here (Excel). The research carried out by the Hans Bredow Institute focuses on mediated public communication and regulatory theory of media systems. Understanding the underlying determinants, assessing future opportunities and risks, and providing orientation for the actors involved is the main focus of the institute’s research, which is widely acknowledged: The German Science Council has stressed the institute’s high level of research and declared it one of Germany’s most distinguished research institutions. The Interdisciplinary Centre for Law and ICT (ICRI), K.U. Leuven, has a proven track record in international research projects and has a wide experience with interdisciplinary research projects, being the legal partner of the Interdisciplinary Institute for Broadband Technology (IBBT; http://www.ibbt.be), a virtual research centre founded by the Flemish government and uniting fourteen research groups from different Flemish universities. The Central European University (CEU) is a research-intensive graduate university in the social sciences and the humanities and occupies an internationally recognised and socially engaged academic niche dedicated to cutting edge interdisciplinary research and policy-analysis. With a strong regional roots and global outreach, CEU through its Centre for Media, Data and Society (CMDS, formerly CMCS) has become a centre of excellence for promoting media and communication studies throughout the Central and Eastern European region and beyond. Cullen International (CI) provides specialist, independent, regulatory monitoring services covering the telecommunications, media and electronic commerce sectors in Europe. Over 100 leading European regulatory authorities, telecom and broadcasting operators use CI’s information services to track regulatory developments across Europe. CI has in-depth knowledge of the EU regulatory framework affecting the above sectors and practical implementation in the Member States. It has developed special competence in the collection and analysis of regulatory information across Europe in a readily accessible presentation format. In the last few years, it has carried out a number of studies involving in particular the collection of comparative data in the context of studies for the European Commission (including a study on the regulation of broadcasting issues under the new regulatory framework and a study monitoring regulatory and market developments for electronic communications and information society services in enlargement countries) or the EBRD (comparative assessment of the telecommunications sector in the transition economies). CI was founded in 1986 and is based in Brussels and Namur, Belgium. Tim Suter brings practical regulatory and policy insight to the research team, given his experience both as head of the UK government’s Broadcasting Policy during the development and parliamentary passage of the most recent communications legislation (the Communications Act 2003), and his subsequent role in the newly created converged regulator, Ofcom, of which he was the senior executive with responsibility for all aspects of content regulation, a member of the statutory Content Board and Deputy Chairman of the licensing committee. He was actively and directly engaged in the discussions around the scope and implementation of the AVMS Directive, both in his role at Ofcom and in his participation in EPRA, the umbrella body for European content regulatory authorities, of which he was Vice-President.On leaving Ofcom he founded Perspective Associates, a specialist advisory company which deals with issues of public policy and regulation in the media and communications sectors, and whose clients include governments, regulatory authorities and media and communications companies. The quality of the analysis and reports has safeguarded by an advisory board representing expertise in the various facets involved in this study (regulatory theory, media policy and economics). - Mark Thatcher: Mark Thatcher is Professor of Comparative and International Politics, Department of Government, London School of Economics. He is a well known expert in the field of regulation studies. His research interests comprise economic institutions and the regulation of network industries, independent regulatory agencies, institutions and institutional reform. - Eve Salomon: Eve Salomon is an International Media and Regulatory Consultant, combining an international advisory role with membership of a number of UK regulatory authorities covering a range of media and non-media industry sectors. Originally trained as a lawyer, she has held executive positions as Legal Director for both regulatory authorities and major commercial broadcasting companies. She is currently Chair of the UK’s Internet Watch Foundation. - Robert Picard: Robert G. Picard, Hamrin professor of media economics and director of the Media Management and Transformation Centre at Jönköping International Business School, Jönköping University, Sweden, is the author and editor of 23 books as well as numerous articles. He is editor of the Journal of Media Business Studies and was previously editor of The Journal of Media Economics. The INDIREG study has been funded by the European Commission. Neither the European Commission nor any person acting on behalf of the European Commission is responsible forthe use which might be made of the information contained in the following report. The views expressed are those ofthe authors. The report does not necessarily reflect the views of the European Commission, nor does the EuropeanCommission accept responsibility for the accuracy of the information contained herein.